Many widgets—from buttons to text—can be turned into various types of links. In addition to a URL, you can link to a pop-up, a Calendly popup, another Lead Page, or even another section on your page. Click the widget to bring up its settings. For headlines or text, highlight the text you’d like to create a link out of or the pencil icon to select all of the text in that widget. Choose your click event: Open a pop-up, Open a Calendly pop-up, Go to an external URL, Go to a Lead Page, or Jump to a page section. Input or select the destination for your link. Adjust any options as needed, then click Save. If you're using a button widget, it's even faster to link click events to it. Hover over your button, then click Add Click Event or Edit Click Event. 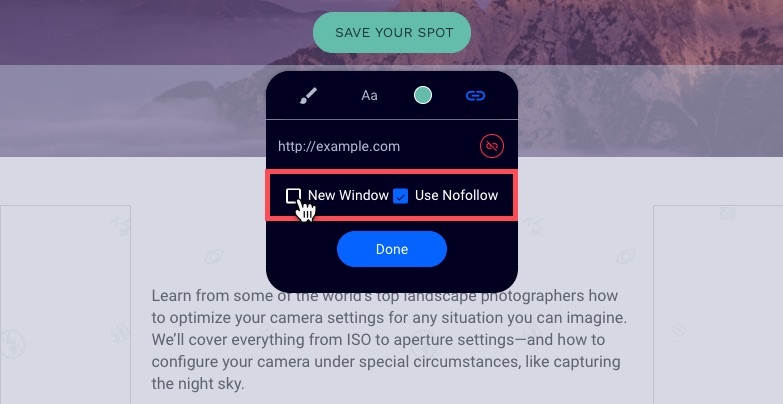 One of the most common click events is Open a pop-up, giving you the ability to create a popup form to entice visitors to opt in to your page. 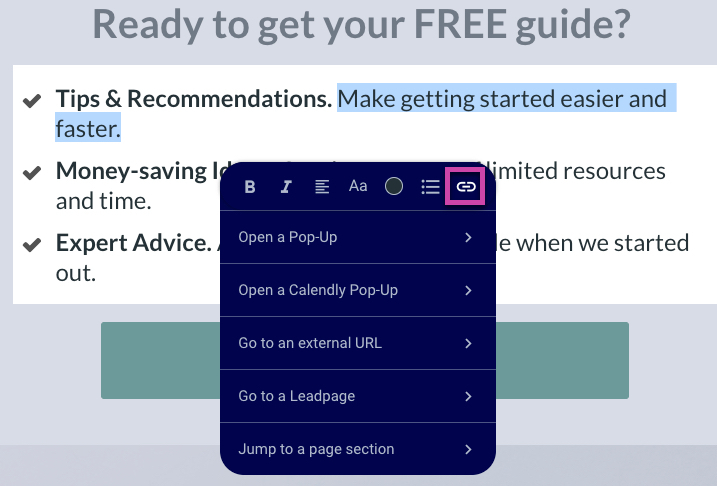 Click here for more information about creating an on-page pop-up. In addition to the Calendly embed widget, a Calendly pop-up is available as a link option. Much like a pop-up, the Calendly pop-up will overlay the page when opened. Just like the Calendly embed widget, there's no embed code necessary when looking to add a Calendly popup. Just the URL to your Calendly will do! If your link leads to an external URL or Lead Page, you can configure it to open in a new window. It’s also possible to enable “nofollow” so your linked page won’t be indexed by search engines. By using the link option Jump to a page section, you can quickly navigate visitors to a specific section further down on the page. Make it easy on yourself by labeling your sections in the Page Layout tab on the left-hand side of the builder. Then, select Jump to page section as your click event and choose your page section. To get rid of a link (or change the link type), navigate to the link icon, then click Remove. For a button widget, simply hover over the button and select Edit Click Event, then Remove. 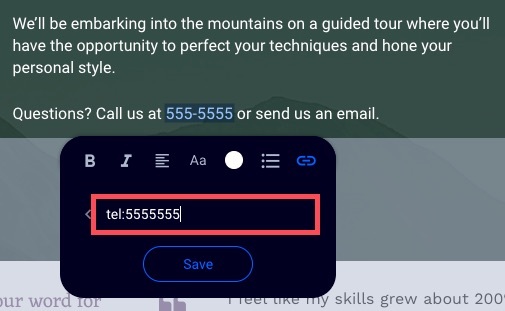 Most mobile operating systems automatically detect and turn phone numbers and emails into links, so it’s not necessary to explicitly create links out of them. Users who click a phone number link on a desktop or tablet won’t be able to make a call unless they have third-party calling software installed. Email links always open to the default email client (such as Outlook, Apple Mail, etc.). Visitors who only use web-based email (such as the Gmail interface) won’t be able to effectively use your link. To link to a phone number, choose the “External URL” option, then input tel: followed by your phone number, like so: tel:5551234567. You can do the same thing with an email address using mailto: like so: mailto:name@website.com. Can I put HTML in a link? No, only valid URLs can be used in links. Instead, consider using an HTML widget if you need to paste in HTML code.